In 1962, Richard Harrington began repairing equipment at his father’s business, Earl’s Lawn Mower Service, in Gaithersburg, MD. Richard had the gift of mechanical ability, and taught himself to repair equipment. In 1978, Mr. Harrington moved the family to Emmitsburg, Md, and opened Harrington & Sons. After a stint in the Navy, as a Seabee, Richard left the family business to learn the carpentry trade. After five years in the home construction business, Richard moved to Germantown, MD. There, he opened a business under his father’s wing as Harrington & Son’s II; where he met Christine. In 1993, Richard struck out on his own, and opened Harrington’s Service Center, Inc; in Germantown, MD. In 1996, Christine joined the company and began learning the outdoor equipment trade. By 2001, Richard & Christine had tired of city life, so they purchased a home, and moved with their son, Seth, to Fairfield, PA.
Harrington’s Service Center was relocated to a rental property in Taneytown, MD (Harney, MD). In 2010, Richard & Christine found a commercial property for sale near their home. The property offered a house and the right commercial zoning. This was a great opportunity to be near home, near work, and to keep their son in the Fairfield School system. In 2010, they purchased a rare piece of property with the right zoning on the corner of Orchard Rd & Waynesboro Pike, in Fairfield, PA. 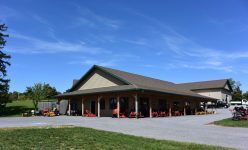 In 2012, Richard & Christine were able to move their business out of their rented location in Taneytown, MD. Harrington’s Service Center was relocated to Fairfield, PA, and became Harrington’s Equipment Company. Our mission is to provide the best products and services at reasonable prices. We offer priority service on the equipment we sell, plus repair all makes and models of other equipment. Note: While there is a similar name, Harrington’s Equipment Company is NOT affiliated with Harrington & Sons in Emmitsburg, MD. We cannot do warranty repairs on equipment sold by them, nor can we be held responsible for any repair work or services they perform. Same family, different company. Thank you for understanding.